I’ve been making this dish for years. It’s a perfect meal for Saturday lunch when you want to get on with the weekend and not spend the day in the kitchen. I regularly make this on Saturdays once the girls’ ballet lessons are out of the way (why, oh why did I go for dance lessons on a Saturday morning?) and it’s simply a case of throwing everything in a roasting tray, tossing in olive oil and bunging in the oven. Easy as. It doesn’t really warrant a recipe, but I thought I’d write it down anyway. It is actually based loosely on an early Jamie Oliver recipe, from his Naked Chef days, but even easier – if that’s possible. So, simple and tasty and the kind of food I have to stop my children picking up and eating with their fingers, until I give in and join them. 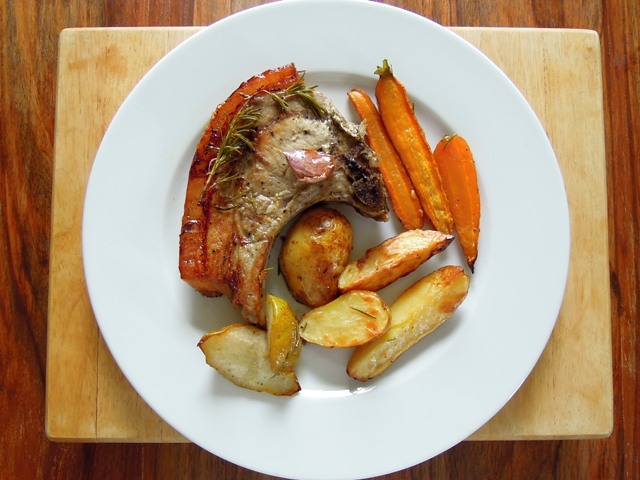 Arrange the pork chops, rosemary sprigs, carrots, pears, potatoes and garlic in a large roasting tray. Season well with salt and pepper. Drizzle with olive oil and toss to make sure all the ingredients are lightly covered. 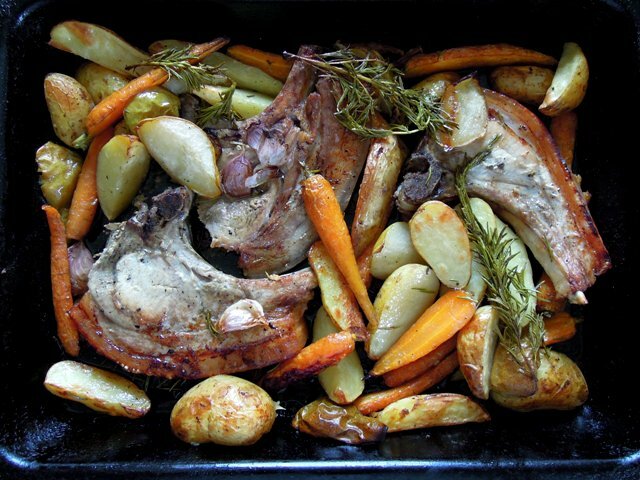 Roast in the oven for 45 minutes to an hour, until everything is nicely browned and turning the chops and vegetables once or twice during the cooking time. The pears will be squishy and the garlic oozy, while the pork chops will be sticky and the carrots will have that lovely caramelised thing going on. The kitchen will smell incredible. Serve with a big dollop of mayonnaise, homemade preferably, or the best shop-bought you can afford. As rosemary is used in abundance in this dish, I’m entering it into Cooking with Herbs hosted by Karen at Lavender & Lovage where the themed herb this month is rosemary. I’d come over any night of the week for that!! It looks lovely and easy. Definitely good for when you don’t want to spend long in the kitchen. That looks so good. Love the colors. You could frame that photo and put it up on the wall! Looks amazing. I don’t tend to cook pork chops but I think I’ll try your recipe out as it sounds really delicious. What a lovely, healthy, speedy, delicious meal. I love the addition of the pear. Must make a mental note to make more meals like this!!! I haven’t had pork chops in years. Its something I used to eat with my dad and I used to love the crispy fat but for some reason have never cooked it for my husband. I love how you have combined yours with rosemary and pears and that everything is cooked in one tray, saves on the washing up and a tasty dish with minimal effort. Great midweek supper. I need to try this. I believe in meat and fruit together but never tried this combo. That does look lovely! making me feel very hungry (it is nearly supper time). Tray bakes are delicious AND healthy! Just a perfect meal in a tray. Will be pinning for later use! Yum, i bet the pears make that dish extra special! Thanks for sharing a great dish here. It is so testy.